Mandy is a mystery mail order pattern. No company or designer name, or date is on the pattern, just the number 883. 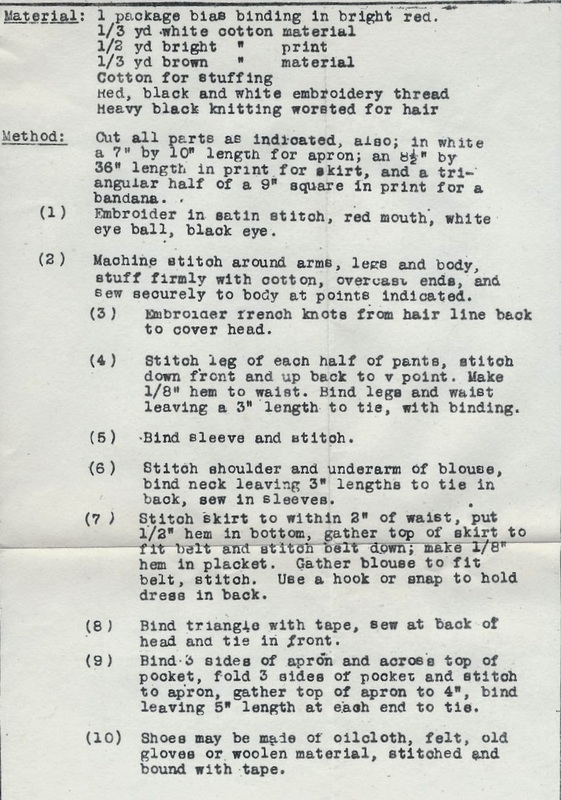 The return address on the envelope is Needlework Dept., 220 Fifth Ave., New York 1, N.Y. 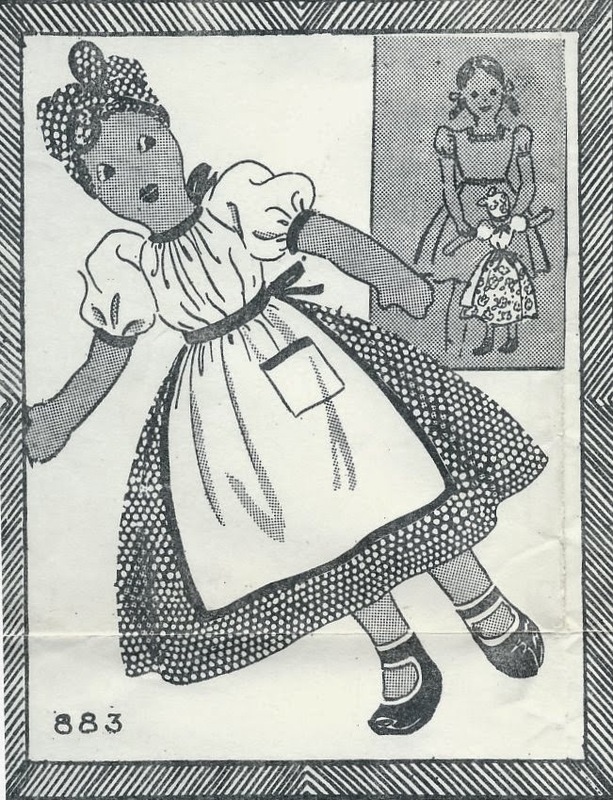 This may be another branch of Reader Mail, Inc., the company responsible for Laura Wheeler, Marian Martin and Alice Brooks patterns, among others. No size is given, but it looks like Mandy would make up to be about 17" tall. 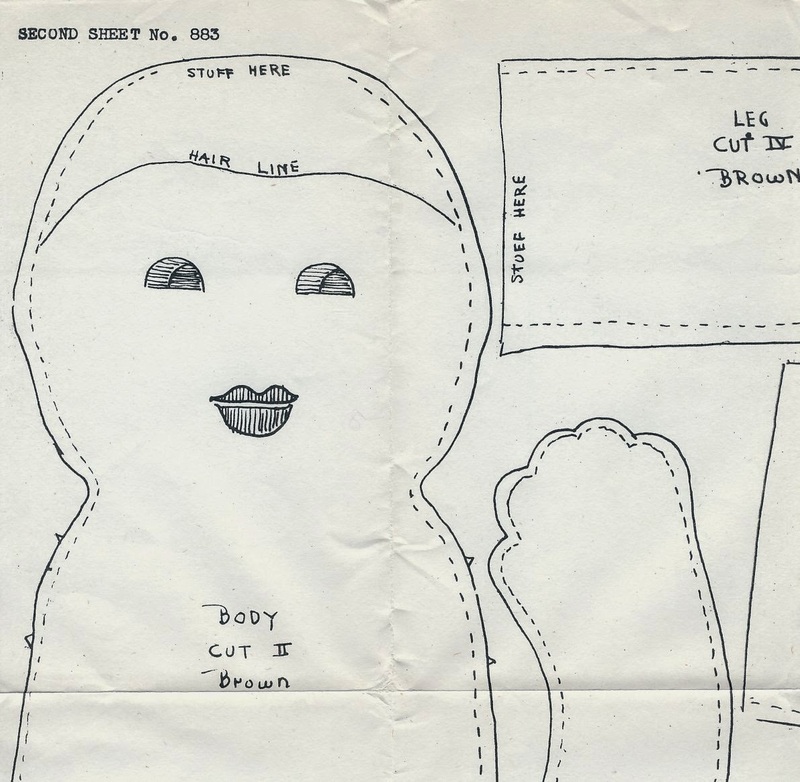 She is designed as a black doll, as the instructions call for her to be made from brown cotton material. Her body is separated pancake style, with the suggestion of fingers in the scalloped tips of her hands. Her facial features are to be embroidered in satin stitch and her hair is to be done all in French knots from "heavy black knitting worsted." Mandy's outfit is in the stereotypical "mammy" style, with an apron over her dress and bandana over her hair. Ankle strap shoes and under pants complete her ensemble. If you want practice using the binding foot on your sewing machine, this is a good pattern to try - the sleeves, neckline, apron, shoes and bandana are all bound in bias tape, which adds interesting detail to an otherwise simple pattern.